Do I need a prenuptial agreement in Pennsylvania? | Pittsburgh Family Law Services, P.C. Do I need a prenuptial agreement in Pennsylvania? First of all, congratulations! Even an attorney with a divorce and family law practice can believe in good marriage, and in working to keep your marriage good. Hoping and working for the best is essential, of course, but so is preparing against the worst. When you get into a car you fasten your seat-belt, because nobody gets to take precautions in the instant they actually need them. You don’t expect that either of you will ever call it quits, any more than either of you would plan to get into a traffic accident. After all, you’re not in this to commit by halves. It doesn’t take much looking around, though, to recognize a sobering truth: some marriages end. Many marriages end. Change touches us all, and not always the way we would choose. Good, honest and caring people encounter challenges they cannot overcome, and end up separated in spite of their best intentions. You may already have faced divorce yourself, or perhaps your fiancée has been through it. I believe in good marriage, but when that fails I also believe in good divorce. One way to “stack the deck” in favor of that goal is to enter into a prenuptial agreement with your future spouse, before you wed. But that is exactly what happens when you get married in Pennsylvania. People often speak about “the marriage contract” without realizing that there really is such a thing. For those of us who live as married couples here in the Keystone State, the Pennsylvania Divorce Code tells us what is (and what is not) property that you will own together with your spouse. It tells you how property is to be divided in the event of a divorce (a process called Equitable Distribution). It tells us about spousal support, and what a court must consider when deciding who gets how much alimony, and for how long. Depending on your situation and needs in the unfortunate event that you and your spouse should separate, the Pennsylvania Divorce Code might turn out to be your safety net, the wolf at your door, or anything in between. The one thing it isn’t, though, is something custom-fit to your personal circumstances and needs. The law allows for plenty of flexibility so that a family court judge has the power and guidance to offer you and your spouse economic justice, but even a flexible system remains one-size-fits-all… and you know that one size never really does. No judge knows better than the two of you, what is good for both of you. Entering into a prenuptial agreement before you marry gives you the chance to tell the judge how things will go in the event of a separation, rather than having him tell you. Know the terms of your marriage contract beforehand. If you ask a Pennsylvania family lawyer to talk to you about drafting an agreement in anticipation of your marriage, one of the first things he should do is to explain to you the workings of the Pennsylvania Divorce Code. That way, you understand what happens in the event that you separate and divorce without a prenuptial contract. Any of the default rules and standards of Pennsylvania that are not changed by your agreement will still apply to you and your spouse, so understanding how the Divorce Code works will help you make the most informed decisions at such an important time. Among other benefits, that conversation will help you decide whether you really do need a “prenup,” or whether instead you prefer to enter into married life without one. The key to choosing your risks successfully is to understand them, beforehand. An experienced Pennsylvania family law attorney will also advise you how to conduct your financial affairs during your marriage, to make sure that you do not compromise your protections under the terms of the agreement. What does a prenuptial agreement do in Pennsylvania? A prenuptial agreement is a contract between you and your spouse-to-be that “customizes the defaults” of your upcoming marriage. To the extent that the terms of your agreement come into conflict with the terms of the Divorce Code, your agreement will have priority. It can protect particular assets or categories of property from distribution to a spouse, determine in advance what kind of alimony might apply under what kind of conditions (or eliminate it altogether), and decide in advance how marital property would be divided in the event of a divorce. Your premarital agreement can even protect property that you hope to obtain in the future, and protect you from debt that does not yet exist. 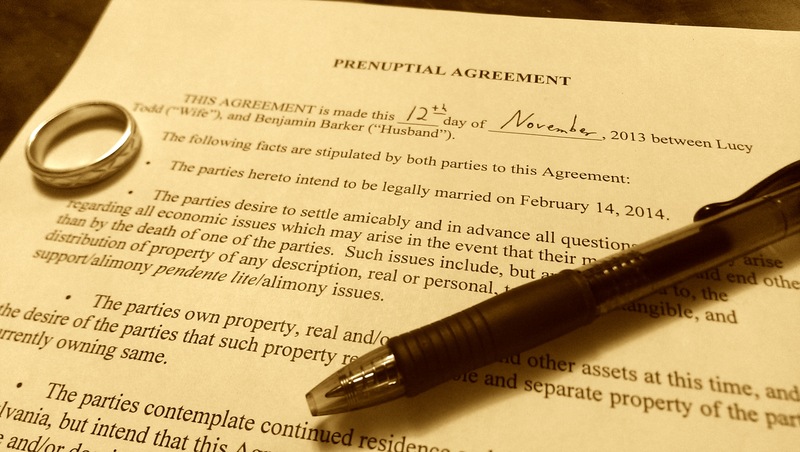 How long does a prenuptial agreement last? A prenuptial agreement lasts as long as you both want it to. Like any other contract in Pennsylvania, the two of you can (for example) build a “self-destruct” into it if you reach a certain anniversary, or of another set of predetermined circumstances comes to pass. Of course, the two of you also can change your minds at a later time and agree to change or revoke all or part of the agreement. If the contract itself does not include termination conditions and the two of you fail to agree to revoke it, though, the agreement will remain in force indefinitely. When drafting your prenup, it is important to take a long view. With prenuptial agreements especially, it is essential to understand that what seems advantageous today may not be so favorable thirty years from now, so careful consideration is as important as careful drafting. A good premarital contract should serve you equally well both next week, and next generation. Full disclosure of assets and other personal economic information by each spouse-to-be is essential when reaching a premarital agreement, because getting caught hiding important information about what you own, owe and earn can lead to your agreement being determined invalid by a family law judge in divorce court. It is also important to discuss entering into such an agreement well in advance of your wedding, so that your fiancée has time to consider and review its terms, and to seek the counsel of a divorce attorney. Raising the subject of a prenuptial agreement with your fiancée can be delicate enough, without adding the surprise of a “take it or leave it” proposition mere days before you go to the altar. You and your spouse will want to sign your premarital contract in the presence of a Notary, and you should sign at least two “originals” so that there is one for each of you to keep in a safe, protected place. Are prenuptial agreements enforceable in Pennsylvania? They certainly are. Your premarital contract becomes effective on the day you marry your spouse, and they are difficult to challenge in Pennsylvania. The law gives such agreements great deference, in that the Pennsylvania Divorce Code places the burden of overturning a premarital agreement on the spouse who is making the claim that it should not be enforced. That spouse seeking to invalidate the prenuptial agreement, to succeed, must prove either that he or she did not sign the agreement voluntarily, or (1) that there was no reasonable disclosure of property or debt by the other spouse, (2) that he or she did not waive that disclosure, and (3) that he or she did not have enough knowledge of the other spouse’s property or debt to be able to make an informed decision. Can the same family lawyer give legal advice to each of us? Unfortunately, no. Even though the two of you are very much in love and plan to stay that way, for purposes of drafting your prenuptial agreement your lawyer must assume that the two of you will some day be on opposite sides of a divorce proceeding. Lawyers who want to keep their professional licenses avoid conflicts of interest, even when the conflict is only theoretical. If your fiancée wants legal advice and protection while drawing up the terms of your premarital contract, he or she will have to consult with a different lawyer. How do I discuss a premarital agreement with my fiancée? That’s always a good question, but a tough one for a lawyer to answer. You certainly know your fiancée better than any lawyer does, after all. Nobody enjoys considering divorce while they are preparing for a wedding. It can be disheartening, to say the least, for your fiancée to hear you say (no matter what words you actually use), “I want you to agree that I am protected in case we should divorce, or the wedding is off.” So, first and foremost, you need to decide for yourself whether your desire for the protection of a contract is strong enough that you will not be able to feel secure in your marriage without one. Identifying “deal breakers” should always happen before the deal. When raising the subject, be gentle, understanding and honest. Bring the matter up early, and certainly before you set a date and start spending money on your wedding. Explain to your fiancée that the agreement will be negotiated fairly between the two of you, and that it will offer protection to each of you. Point out that the best way to get out of trouble is not to get into it, and that your goal is to minimize or eliminate the prospect of fighting between you if your marriage does not succeed. Reassure your fiancée that you will hide nothing, that you will give him or her space to think and to get professional advice, and that you are open to his or her concerns and priorities. Encourage your fiancée to talk to a lawyer about how to stay protected, so that nobody needs to worry that unfair advantage is being taken. If it is your fiancée who is proposing the agreement, meet with a lawyer so that you and your fiancée can discuss your respective needs and concerns on a level playing field. The best time to stop a fight is years before it starts. A well-drafted prenuptial agreement can let you and your spouse relax into your marriage, knowing that even should the road ahead narrow too much for you to be able to walk side-by-side, nevertheless it will not lead you into a battlefield. May the two of you share a long and beautiful life together, and may your future be lawyer-free! I have a few questions that I have been unable to get a clear and concise answer for concerning my drafted prenup agreement in the state of PA. Does my prenup have time be drafted by an atourney to be valid I this state, or can I draft my own prenup and have it notarized to be considered valid? In the state of PA do I have to have witnesses present at the notary in order to be valid, or ia it only a recommendation? The last question I have is if my husband and I were to ever move out of state, would the prenup drafted in PA still be valid even if we move to a state that say, requires 2 witnesses and an attorney drafted prenup in order to be valid? 1. No, your agreement does not have to be drafted by an attorney, any more than your roof needs to be repaired by a professional roofer. or that you need a plumber to fix your leaky faucet. That said, sometimes the best tool for the job is a repairman! I’ve seen some pretty badly drafted prenuptial agreements, and plenty of people who are trying to accomplish a specific goal but don’t understand the context in which their actions are being taken. Since no one can predict the future, it is important to realize that a dependable prenuptial agreement needs to suit your needs if you were to split after a year, and if you were to split after thirty years (lawyers have to assume separation and divorce for purposes of drafting, because otherwise you’ll never need it!). A Pennsylvania divorce lawyer can also give you strategies to ensure that you don’t take action during the marriage that will undermine your goal in entering into a prenup in the first place. 2. It’s not a bad idea to have a disinterested witness sign the prenup, but in Pennsylvania all you need is a notary. Technically you don’t even need that, but is is a Very Good Idea to have your ante-nuptial agreement notarized. 3. As a Pennsylvania lawyer, I am knowledgeable about PA divorce law but no other state’s. Fifty states might as well be fifty independent countries when it comes to most matters of divorce, because every state has its own unique domestic relations code; but in general, when a contract such as a pre-nuptial agreement says that it is to be interpreted and enforced according to the laws of the State of Pennsylvania no matter where you move, I would say that you have good odds that you will be reasonably protected. When in doubt, a little research can go a long way if you do it before you decide for certain to relocate out-of-state.